Dutch Meteor Society (DMS): Meteorite Impact Greenland? Eye witness reports, seismic data and video recording by Niels Bohr Institute, Geophysical Dept. This very first news originates from Henrik Persson (Denmark) of december 12. Jens Sveistrup : Why the Greenland_cloud_event is NOT related to a meteorite impact! Keld Rasmussen : The Meteorite event on/over Greenland 091297 0515 local time. Gary W. Kronk : Greenland Impact? To provide accurate and timely information on meteors and anything related with it. We will publish information only from known sources and which is, to our judgement, reliable and traceble. Information published on our website possible may be contraversy. It is our opinion to provide you with all kinds of information which helps you in determining and/or analysing scientific problems and ultimately retrieving the answer to the invoked questions which may rise. We will point you to contraversy information and warn for jumping to conclusion to early. So please do not be angry if you find information which you do not agree with; other people might do. The authors of these WWW-pages are not responsible for anything caused by the written/scanned materials and we are not responsible for any copyrighted material which might be protected by any law. A big meteor impact has probably occurred in Southern Greenland at 61 25N, 44 26W on Tuesday, December 9th app. 08.11UTC (05.11am local time). The position is on the ice cap app. 50 kilometers NE of Narsarsuaq Airport. The position has been determined on the basis of observations made by a Danish and a Norwegian trawler near the east coast of Greenland, and a Danish trawler at a position in the bay off Julianehaab. Based on fairly accurate direction findings and the fact, that the trawlers were situated on both sides of Southern Greenland it can be determined, that the meteorite fell on land. Observations of the satelite lighttrack from Nuuk indicates that the meorite passed a bit south of Nuuk in southeasterly direction towards the mentioned impact site in Southern Greenland. Seismic disturbances have been observed on Svalbard and Finmarka (Norway). These tremors are observed at 08.21UTC and 08.23UTC and are assumed to relate to the impact or the passage of the meteorite through the atmosphere. The signals did not allow a seismic localization of the event. The observations are made by NORSAR (Norwegian Seismic Array), Kjeller, Norway. Fainter signals were observed in Finland and Germany. The seismic stations in Greenland (Sonder Stromfjord and Danmarkshavn) has no observations. Further seismic data will be collected from Iceland and Canada in order to confirm the visual localization. Observations from the satellites ERS1 and ERS2 are being planned. These satellites observe the surface of the Earth using radar. The flashes observed in conjunction with the meteorite were so bright as to turn night into daylight at a distance of 100 kilometers and can be compared to the light af a nuclear explosion in the atmosphere. However, we stress that there is no reason to belive other than natural causes. During the day, the position will be overflown by an ice reconnaissance plane, from the Ice Central in Narsarsuaq on its planned flight from Kap Farvel to Nuuk. The event can in size probably be compared to the Kap York meteorite, that in prehistoric time fell in Melville Bay, Sassivik south of Thule. Findings from the meteorite consist of a number of iron meteorites totalling 50 tons. One of these ironfragments can be seen in Copenhagen outside the Geological Museum. Collecting and studying material from this meteorite has great scientific value. It is fortunate that the meteorite fell on land, but a search on the ice cap is difficult and in winter impeded by bad weather and darkness. Since December 9th 30-100cm of snow has fallen in the area and before summer smaller fragments will be covered by 3 meters of snow. According to Danish law, findings of meteorite material must be turned over to the authorities, in this case they will be the property of the Greenland Home Rule. suspected "plume" of the meteorite impact. Please be warned however: this theory is by no means proven! 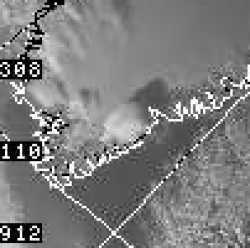 The large dark cloud which is best seen on NOAA channel 3 imagery on december 9, 14:24 UTC is, according to Jacob Kuiper, in fact a large lenticularis cloud the occurence of which is not uncommon in that area. But pay attention to the much more smaller smooktrail just to the south of the big cloud. This smook trail might possibly be the result of the meteorite impact. But be prepared this is not proven yet! That leaves the other evidence. But some caution might well be in place. So perhaps a nice fireball with a nice size meteorite. Two days ago the Danish news channels had reports of a giant flash seen by many people along 2000km of Greenland's west coast early on December 9th.. A video from an outdoor surveillance camera was also shown on TV. Based on interviews with several observers it was concluded that the meteorite probably was lost in the sea. One would think the matter closed, but now reports from the thinly populated east coast and from ships off the coast begin to trickle in. These also tell of a very bright light, a weather station has even observed a smoke column. Locals in Angmassalik talk about a discololoration of the sky as never seen before. If weather permits a plane will be sent to the area later today - several plots indicate the impact site to be 61N 43W. So the theory goes that the meteorite observed at the west coast was a fragment of a much larger meteorite hitting the east coast. These are all third or fourth hand informations - BUT I have seen NOAA 14 satelite images of Greenland showing some very unusual features. I am not an expert, but I have seen many satelite images of Greenland and have never seen anything quite like this. If this really is an impact, it is of huge dimensions. I would estimate the size of the plume(?) to be 7000 square kilometers reaching high in the atmosphere! However before jumping to any conclusions, it could fun if someone with more skill in interpreting satelite images (Todd ?) would take a look. You'll find them at http://www.sat.dundee.ac.uk/abin/browse/avhrr/1997/12/9/ go for the 14.24 passage and be sure to view several channels (I suggest 2,3 and 4). The images are free but the site requires a userid and a password, which can be obtained by following the instructions. The images are not full resolution - if anyone have access to a full resolution image of the area Todd, again ? ), I'd like to see a copy. News is coming out that a huge meteor event has happened on December 9,1997 over southern Greenland. Images of the plume have been caught on NOAA satellite 14, beginning with pass 14:24UT over 61N lat.43W long. If you look at the images for subsequent NOAA-14 passes, you can follow the plume as it rises and drifts east for a day and a half. The thermal band (infra-red) channels show the plume as a brilliant white column during the night-time passes of the weather satellite. 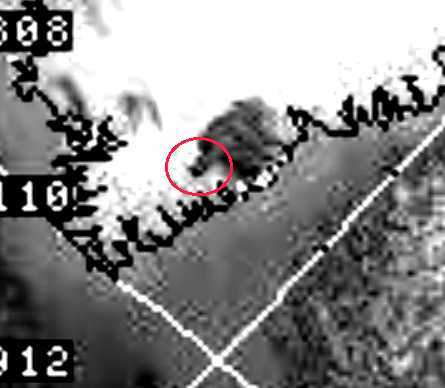 It appears that an enormous meteorite has fallen over the southern part of the Greenland Ice cap. The event was witnessed by people on the west coast of Greenland, and by fishermen off shore. Further records come from seismic data, weather satellites, and a video camera at Nuuk. The event occurred on December 9, at 08:21 UTC. At this moment, local solar time was 05:21 A.M. According to reports, the sky was clear. Seismic records show a very special event. It lasts more than 10 seconds, indicating a time extended source. It is a high-frequency event, reminiscent of the Lunar meteorite seismic records made by the Apollo missions. This makes phase correlation, hence localization, difficult, but initial indication is that the event occurred in Greenland. A parking lot video surveillence camera in Nuuk, capital of Greenland (64 North, 51 West), recorded an extremely bright flash of light from a moving source. One the footage shown on Danish TV, the event lasted about 2 seconds. However, the time compression factor was not reported. At least two weather satellites show the dramatic development of a cloud system near 63 degrees North 45 degrees West. The clearest images can be obtained from a polar orbiting satellite monitored at the Dundee Satellite Receiving station. One set of multicolor images show a dark cloud 120 km across, on December 9 14:24 UTC Channel 3 The cloud is still visible 26 hours later, at which moment one can see a 100 km long dark line on the Ice Cap, marking the western edge of the cloud. The line points some 10 degrees West of North, which we interpret as the arrival direction of the meteoroid. The cloud height has been estimated by the Tycho Brahe Planetarium to be 6 - 8 km (based on the shadow cast). The enclosed volume of air is thus at least 50,000 cubic km. If the moist air contains 0.1 gram of water per litre derived either from the meteoroid or from evaporating ice, this amounts to 5 billion tons. The minimum meteorite mass required to melt and evaporate this amount of water is 4 million tons, if the velocity of the impactor was 70 km per second. According to Danish TV (DR1 and TV2 text-tv), a search mission is being planned by the ice service at Narssaq. Old tradition dictates that a fall is named from the closest postal office. This is Qaqortoq, at the south tip of Greenland. The city was formerly called Julianehaab. The above report was compiled using data supplied by Morten Bo Madsen, Anja Andersen, Torben Risbo, and Lars Lindberg Christensen. Note: information contained here is not an official product of Copenhagen University. Just joining this list some days ago. I have seen a lot of mails concerning possible meterorite impact in Greenland on 09-12-97 05:10 local time. I have been in radio and telefone contact with at least 5 eyewithnesses. And their stories are published at the Danish astro-mail list. Seismic data included. In this moment I haven't had the time to translate. Shortly: Things point, that a huge meteor was flying over the water in a line outside the coast of Nuuk to an explotion in a very low hight at the southmost inlandside of Greenland. It seems to be well documented. >I had thought the velocity calculated below a mite high, anyway. >atmosphere at 70 kilometers/sec. Has anyone heard any more about this event? Yeah, this seemed high to me too. That's about the right speed for an impactor in a large-aphelion Solar orbit if it hits us head on. That is, basically the maximum speed for a Solar System body to hit the Earth with. I think they used that value since they were quoting a _minimum_ mass, and to get the minimum mass for a given cloud size (and implied energy), you use the maximum speed. >for the body somewhere between 500 and 1000 meters. The first news stated that the meteorite was 60 tons, that it had exploded before making impact in the glacier (? 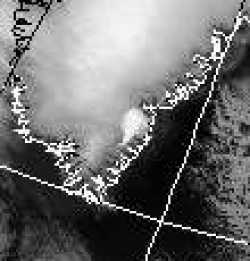 ), that much cloud was seen above the landing site in a satellite image (size of cloud was comparable to the size of Sjaelland in Denmark), pressure wave was measured in Scandinavia (atmospheric pressure? ), a light trail was seen from an Icelandic (?) plane south of Greenland, The Tycho Brahe institute in Denmark intends to send an expedition to the site immediately. I was a little disappointed with the [broadcast] news. It was not very detailed. They told that the meteorite was 60 tons according to the Tyco Brahe Institute in Copenhagen. It fell about 100km north of Hvarf. 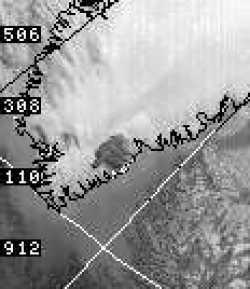 At first it was thought that it had fallen in to the sea, but the satellite image displayed a cloud about the size of Vatnajokull. A light was seen Tuesday morning from a ship and an Icelandic plane, and people in the town Nuuk in S-Greenland did also see some light. It seems that the site is near Cap Helmut Trolle. The air pressure wave was recorded in Scandinavia. The TycoBrahe institute considers this incident extremely important and is preparing an expedition in order to find the meteorite. The big Greenland meteorite explosion of December 9 1997 has now apparently vanished, just as did the Honduran impact of November 22 1996 and the El Paso bolide of October 9 1997. 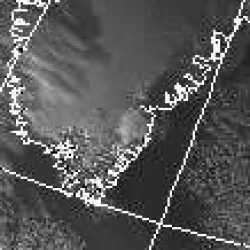 Latest reports are that the large cloud and other remote sensing data from Greenland are unrelated to the bright meteor that was widely seen. So once more we have a bright meteor, lots of media attention, and false associations. Perhaps I shouldn't bother to send out such rumors before they are confirmed, but we always hope for something substantive. Meanwhile, I continue to be interested to see how much media attention, and even public alarm, accompany really bright meteors or bolides. I've just seen Keld Rasmussen's (hej Keld!!) posting about eye witness reports (sent to IMO-News and meteorite-list), so I will not give any reports. Instead I have done some investigations myself. At the moment it's generel believed that no impact has occurred. Well, at least no impact connected with the observed dark cloud on satellite photos from 9. Dec. 97. It is believed that the cloud is just an ordinary meteorological phenomenon. But if so, it should be possible to find the same structures on other satellite photos. And that it is!! I checked satellite photos (again from Dundee) on all dates in the periods Nov. 96, Dec. 96, Nov. 97 and Dec. 97 until 9. Dec. 97. On photos from 10. 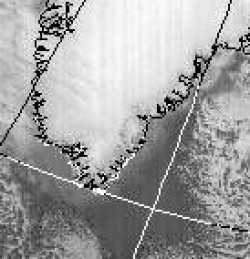 Nov. 96 two similar dark clouds are seen in the same area of Greenland. Dark clouds can be seen on images from other dates too, but less clearly. The combination of eyewitnessrapports from the event points that an impact have happened. Observers have reported of a light very low over the horizon, and this compared to the speed of the object make the scientist in Copenhagen Niels Bohr Institute to believe that an impact have taken place. In this moment all is guessing. Today the area have being observed from air. Hope we soon have result. Copenhagen Astronomic Club. Kopenhavns Astronomiske Forening. The Meteorite event on/over Greenland 091297 0515 local time. This mail concern eyewittnes rapportes in english and short form. Tanks to Henrik Persson from KAF for translation. In the last week I have collecting information from citizens in the area in Greenland. It is really fantastic. I can hartly breath. All rapports are first hand information and reliable. But ofcourse many of the people are not familiar to make a detailed descriprion of such a phenomenea. Whats not in the description is that most people thought that they vhere in the mittle of a nuclear war, or they vhere under fire of ballicstic missiles. All are awhere that they have seen a phenomenea - once in a lifetime. This mail is sent to other maillists. If any of you reply to mee via the mail list - please remember to include the name of the list. Geophysical Institute of Copenhagen University has taken on the task of coordinating information about the phenomenon in Southern Greenland. As a consequence I was contacted by lector Torben Riisbo and guest lecturer Holger Pedersen, who wanted further information. Since a flight reconnaisance is imminent, we agreed on calling eyewitnesses at Norwegian trawlers via Immarsat (At a cost of $8 pr. minute). I was invited to come to the institute and place the calls from there. First mate Davor Mohr was on duty 0912 at app. 05.15am on trawler Timmarut. Position 60.13N 46.43W course westerly. The sky was clear and he observed faced west. From direction 270-290 deg. he saw an enourmous fireball, moving in a high track until it disappeared i direction 90 deg. It moved in a curve downwards. The ball did not vary in brightness and behind it a luminous track was seen. The event was not terminated by a flash. The fireball lit up the ship as well as the mountains on shore. Color described as red and glowing. DM was not sure about the angle, but believs the meteor was very low over the horizon at the possible impact site, perhaps below the mountains app. 40 kilometers away. The event lasted 5 sec.. He was chocked and dumbfounded. He expressed, that he possibly felt radiation heat, but is unsure. (It was obvious, he felt this sounded wrong). No sound or disturbances of ship's electronics. Captain Tumren was on the bridge of trawler Halten Traal 0912 at app. 05.10am. Position was 62.05N and 41.10W course northeast. He also observed a fireball, apparently moving in southwesterly direction, were it disappeared at 230-240 deg. very low over the horizon, possibly below the mountains. Luminance was constant, but terminated in a very bright flash, much like a lightning. He described the color as bluish and it lit up the wheel house. No sound or electronic disurbance was observed. Mate Jens Ole Nielsen was on duty on trawler Nicoline C at 62.55N 51.35W off Fiskenæsset in South Greenland. The sky was clear. He did not se the fireball itself, but noticed that the wheel house and the mountains were lit by a yellow-red light. The phenomenon was moving south, and seemed to get a little bit brighter doing so. He said: "Everything was lit as if in broad daylight". No sound or electronic disturbances detected. First mate Jørgen Eriksen was at 0912 app. 0510am on duty on trawler Regina C at 60.55N 42.15W. He saw a fireball coming from north and disappearing at 320-330 deg. When detected the object was app. 10 deg. above the horizon, and disappeared behind the mountains, silhouetting them. Brightness constant at first, but when behind the mountains a bright flash was observed. JE describes it as a very violent explosion. The color was described as bluish as the center in a electrode welding on iron. Around the center the color was light green. From the glowing track glowing pieces fell towards the mountains. During the last part of the event the object was moving in a direction of 45 deg. as seen from the observers viewpoint. On fishing map 251 from Deutche Demografische Institut JE has estimated the end of the track to be behind and between the mountains Kap Olfert Fischer og Nuk. No sound or electronic disturbances observed. Police officers Kenneth Stridsen and Lars Heilmann from Nuuk was at 0912 0510am on patrol in Nuussuaq, Nuuk. Kenneth noticed a fireball the size of the full moon or more. The ball came from north and moved south. It was estimated to pass to the west at an elevation of 70-75 deg. Color described as orange-yellow with a tail of fire. The officers left the car, but heard no sound. No electronic distubances observed. From Niels Bohr Institute, Geophysical Institute in Copenhagen Torben Riisbo told that seismic data indicate that an impact as such, did not occur. Seismic stations on Svalbard and Finmarka (Northern Norway) have registered impulses indicating a more diffuse pressure affecting the southern part of Greenland. Officer on duty at the Greenland Command, Thomas Pedersen has Sunday afternoon informed us, that no new eyewitness reports have arrived the last couple of days. Monday a reconnaisance flight will pass the possible impact site, trying to locate fragments - but a lot of snow has fallen since the event. The plane will carry a camera team from Danish TV2. All information are for free, but remember to refer to source: Keld Rasmussen, Københavns Astronomiske Forening. Denmark. I have actually spent a fun weekend trying to gather up the raw data on the "Greenland Impact" and have come up with some interesting information. Most of my time was spent examining the photographs from the satellites NOAA 12 and NOAA 14. The latter produced the best photographic account of the "impact plume". The "event" was supposed to have occurred at 8:21 UT on December 9, 1997. Images from the two NOAA satellites are available for 8:23, 10:12, 10:17, 14:26, 16:07, and 18:27, to name just a few. It is extremely bizarre that absolutely no sign of the "plume" was visible until 14:26. This has to be considered as very suspicious. Every model I have ever seen of Earth impacts, as well as mine and everyone elses observations of the Shoemaker-Levy 9 impacts, indicate that a plume should appear immediately. I will accept that it may not have been visible at 8:23 because of possible errors in the time of the observation, but it should easily have been visible by 10:12 and 10:17. Instead, there is very little difference in the cloud patterns of 8:23, 10:12, and 10:17, indicating rather serene conditions. When the "plume" is visible at 14:26 and 16:07, the first indication is that it was rising. The reason for this was the shadow on the ground, which is visible in the visible-light images. The shadow definitely moved northward and a little eastward. On the other hand, shadows for other clouds look slightly different as well, and calculations by myself, after considering the angle of the sun, indicate the height of the "plume" did not change between 14:26 and 16:07; thus, the rising "plume" is actually a stationary "plume" made to look as if it was rising because of a changing sun angle. Another image was obtained at 18:27. This also showed the "plume", but the sun had apparently already set and no visible light images were available, only infrared. The only interesting item that has not been mentioned in other reports, that I am puzzled by is the apparent temperature change within the "plume". NOAA 14 photographed in different levels of infrared light. 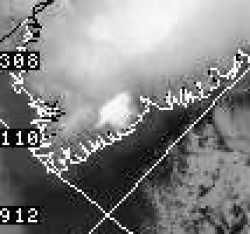 On images using the "channel 3" level, the "plume" is very dark at 14:26, quite different from other clouds, but white like other clouds at 16:07. I am not sure what the explanation would be for this. Finally, the last piece of evidence concerning this "impact" is the absence of any seismic data. I searched several of the world database collections, as well as seismic data from Denmark, Norway, and England, and found nothing. Earthquakes with a magnitude of less than 2 were frequently listed, but Greenland never experienced anything. Not on the 9th, or any of the days before and after. Unless some new information is offered, I have serious doubts that the "Greenland Impact" actually happened. I agree with Marco Langbroek that we might have a fireball, at best, and a coincidental cloud formation. I have been sitting back taking a quiet look at the eyewitness accounts of the event and the other evidence as presented on the very fine Danish homepage of the Bohr Institute. There are things that worry me. One: why does not a single eye-witness mention experiencing a pressure wave? According to the press release there is an airfield at 50 km distance from the supposed impact site. If the 'impact' was strong enough to be seismically recorded at 2500 km distance, then you expect that they at 50 km must certainly have experience blast effects. Also, people further away should have experienced at least something. A pressure wave is the most direct physical result of a large impact. The sun is about -27. So the fireball must have been less. In no way comparable to an attomic flash (which is even brighter than the sun). I think the brightness needed for lighting the landscape has been overrated. A -15 to -20 fireball is enough. I experienced a -15 on November 16 1995 in Spain. It lit the hill and trees in front of me very brightly (i was looking opposite the fireball at that time while climbing that hill!). From the witness reports, I really see no reason to think that the fireball must have been brighter than -20 magnitude. That makes clear that you shouldn't expect tons of meteoritic material to be found (I have seen likenings to the Cape York meteorites in the press release). At best, you'll find a meteorite (or fragments of it) of several decimeters, but you shouldn't think in terms of multiple meters size. And perhaps even that larger meteorite is not there. The -15 fireball I mentioned did NOT drop a meteorite but had burned up (as our photographic data showed) when it reached 27 km altitude. The previous month, Czech astronomers photographed a -20 fireball over Poland. It had burned up already at 50 km altitude. Most eyewitness accounts of the Greenland event are from some distance. Thus, that the trail almost reached ground as seen by them does not mean that the fireball actually reached ground. Actually, most meteoritic fireballs don't, only very large impacts do. Meteorites, even the somewhat larger ones, usually stop illuminating when at about 25-15 km altitude: they have been so much slowed down by atmospheric drag that they no longer illuminate and begin the so called 'dark flight', a free fall essentially. When there is some horizon obstruction (e.g. mountains) and the fireball extinguished at say 30 km altitude, an eyewitness at more than 100 km will see it extinguish close near the 'artificial' horizon. Yet, I fully admitt that there are some intriguing things. The seismic data are interresting, though at this moment also very inconclusive it seems. And the cloud photograph remains to bear some details (though the large cloud might be not related to the event) that are intriguing. But at this moment I feel that they are not sufficient to conclude that an impact is certain or even likely. At this moment, there is a set of fireball sightings, some possibly related seismic data, and that's it. I feel a little bit unhappy about the 'certainty' expressed in many messages and I feel that some aspects (e.g. brightness) might be overrated and that is what is causing some 'unjustified' excitement, perhaps. That does (emphasis!) not diminish the importance of the event and the investigations!!!!! Please note! I would like to say (and this is really sincere) that you Danish are doing a great job at the moment. Please continue the efforts and reporting! This message is hopefully a way in which I can contribute to your research by trying to set things in a proper aspect where I feel some aspects seem to be overlooked. So regard it not as criticism, but as constructive comments please, meaning to help you to arrive at a clear picture of what has happened. Several times a year, there is a story in the press about an asteroid that narrowly misses the earth. One of the nearest--and largest--misses was by one that whizzed by at little more than the distance of the moon in May 1996 and was clearly several hundred feet across. A closer encounter in December 1994 was with an asteroid perhaps only 20 feet in diameter. Comets can also be a hazard, as was illustrated earlier that year when a score of cometary fragments made a dramatic score on Jupiter. It is only a matter of time before the earth sustains a direct hit. Clearly, some objects are potentially more dangerous than others, and astronomers have often worried about how to distinguish the serious problems from the wolf-crying cases that are publicized all too often. Some would rigorously examine the probability that the range of uncertainty in the predicted position of each object over some interval of time includes that of the earth and then compute the kinetic energy of a possible resulting collision. Others are content to identify objects that may come close enough and perhaps be large enough to bear watching over a less definite timespan. The latter approach inspired the rather simple definition of a "potentially hazardous asteroid", the hundredth member of which was recognized at the beginning of September. The longest-known asteroid in the broad category of what are nowadays called "NEOs", or "Near-Earth Objects" was discovered 100 years ago next August. This is Eros, and a calculation published last year indicated that there is actually a very good chance that it will collide with the earth during the next million years. Extend that to 100 million years, and much the same will be true for all the other 419 asteroids now classified among the NEOs--unless they collide with the sun first or are gravitationally ejected from the solar system. Sometimes the NEOs are separated into "Atens", "Apollos" and "Amors", according as to whether they have orbits smaller than that of the earth, whether they go closer to the sun than the earth does, or whether they pass somewhat beyond to the earth's orbit on the outside. Given that the closest distances of the Amors to the sun are currently as much as 30 percent larger than the earth's distance from the sun, it is also appropriate to include among the NEOs the majority of the known comets, thereby yielding a total of more than 1000 known NEOs. But almost all of these 1000 NEOs will "not be a problem" over even tens of thousands of years! Even though these objects do pass from outside to inside the earth's distance from the sun and back, many of their orbits really come nowhere near the orbit of the earth. Recognizing this, the concept of an ECA, or "Earth-Crossing Asteroid" was introduced some years ago to refer only to those asteroids that might conceivably approach us, even when one considers the manner in which their orbits will gravitationally evolve over tens of thousands of years. But that calculation of what are termed "secular perturbations" is quite time-consuming, is meaningless if the actual observations cover only a few days, and can be significantly in error if there are close approaches to or low-order resonances with the major planets. From an entirely practical point of view, we are really interested only if there is to be a collision with the earth over the next couple of centuries. Taking the probabilistic approach thus has merit in this connection, but it does not say anything about the situation beyond the time interval for which the computation--which is again quite time-consuming--is actually done. In any case, there is a danger in taking the "computation of the error ellipsoid" too seriously. This computation assumes one really has some measure of the accuracy of the observations, a point that is particularly troublesome for observations substantially isolated in time from the bulk of the data. It can also be in error if the assumed force model is wrong, as could happen if one ignores a close encounter with some other planet or asteroid; and if the object of concern is a comet, there is the problem of the very imperfect knowledge of the nongravitational force arising from the reaction of the comet to vaporization of its icy constituents. Furthermore, the calculation of the collisional kinetic energy must also be uncertain. This depends on the object's mass. The mass in turn depends on the density and the radius. Any estimate of the density is a pure guess. The radius depends on the albedo and the brightness. Except in those rather rare instances where detailed observations of the brightness have been made in different colors, the albedo, or efficiency with which the object's surface reflects sunlight, is again a guess. Finally, the observed brightness itself, which is in fact used to compute the absolute magnitude--a number showing how bright the object would be if it were located such that it, the sun and the earth were at the vertices of an equilateral triangle--is often itself quite a crude estimate. In short, one can go to a fair bit of effort to compute an impact energy that is significantly in error. So we come to the definition of a potentially hazardous asteroid, or PHA. To be a PHA, an object should have an orbit that brings it quite close to that of the earth, at present and for a couple of centuries into the future. The object should also have an absolute magnitude bright enough that the object is likely to be large enough that a collision would result in widescale, perhaps even global, damage. The numerical limits can be debated, of course, but it is not unreasonable to choose an orbital distance of 5 percent of the distance to the sun (say, 5 million miles) and an absolute magnitude of 22 (which is likely to include all objects down to a diameter of 200 meters (650 feet), which is in turn at a level where an ocean landing is likely to yield devastating tsunamis on even distant shores). Of course, if the orbit has been computed from observations covering several years, we can examine the possibility of encounters with the earth at specific times. But even when an object has been observed for only a few days, the minimum distance between the orbits is generally well established, even though the actual location in the orbit is completely unknown. It is even sufficient to simplify the computation on the assumption that the earth's orbit is a circle. Furthermore, in many instances the minimum orbital distance is unchanged for a couple of centuries. Severe changes in this quantity occur mainly for the asteroids with revolution periods close to one-third that of Jupiter, a point that needs to be checked as the orbit computations improve. Close approaches to Jupiter are of course also a problem, but that applies mainly to short-period comets, for which it is unwise to use the PHA definition. Known long-period comets are also not a threat because, by definition, they can make no more than one approach to the sun over the course of two centuries. The first PHA was Apollo, discovered in 1932 and eventually rediscovered many revolutions and 41 years later. The same was true of Adonis, discovered in 1936. The third PHA was Hermes, discovered on its particularly close approach to the earth in 1937 and lost ever since--a halfmile-sized object that is therefore one of the most dangerous NEOs. Half of the PHAs have been found since 1991, one quarter since 1994. The year 1997 has so far seen seven new PHAs. The first of these was under observation for only six days and is therefore lost. The others, including the latest, 1997 QK1, have been tracked for at least 20 days and can probably be reobserved in future years, if the effort is made to search for them. That effort would probably be worthwhile. Descriptions of sound and aerthquake-like phenomena are consistent with a sonic boom, looking at the mentioned time-lapse of 3-4 minutes. A real earthquake through impact would have arrived much quicker after the fireball (waves in solids move at about 3-6 km/s, while shockwaves in air (sonic booms) move at 300 m/s, much slower). Sonic booms are regular phenomena with bright fireballs. They originate beause a meteoroid penetrating into the lower 40 km of atmosphere creates a shockwave because of its supersonic speeds at that moment, combined with the object itself slowing down. The mentioning of more than one fireball is interersting. Perhaps he did see only the end of the trajectory, and the account relates to fragmentation at the end. That can aid survival of fragments. As far as I can judge now, this must have been a fireball near -15, perhaps with sonic boom and terminal fragmentation. This could mean that some meteorite fragments can have survived. Yet, in honesty, it is becoming clear now I think that this is NOT a very large impact, but rather a possible meteorite impact of average size.